This is the birthday card I recently made for my sister’s birthday. I’ve reverted to one of my favourite colours again … Purely Pomegranate! I just love the Purely Pomegranate satin ribbon 🙂 There is a lot of white for this card though and a dash of Pixie Pink. I like the crisp and clean look. 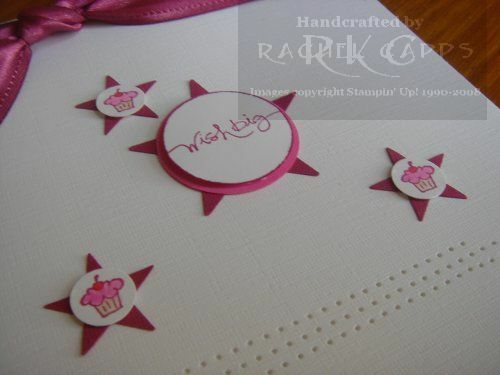 I used the excellent Short & Sweet stamp set again … it really is a wonderful stamp set! And today is the last day you can purchase it for 20% off! So if you’d like to order it, let me know now because I am definitely placing an order on the evening of the 31st October 2008. I came across this ever-so-cute baby card a little while ago and then … no babies! So, now we have a new baby in the family (my cousin’s baby), I had the perfect reason to make this adorable onesie card … originally created and inspired by the talented Lauren Meader. 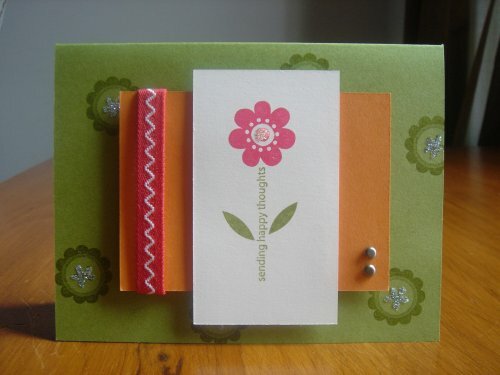 You too can learn from Lauren because she kindly shared a tutorial for this card on her blog here. In addition to making a onesie card … I also have the chance to play with my new Short & Sweet set (20% off this month) … perfect!! 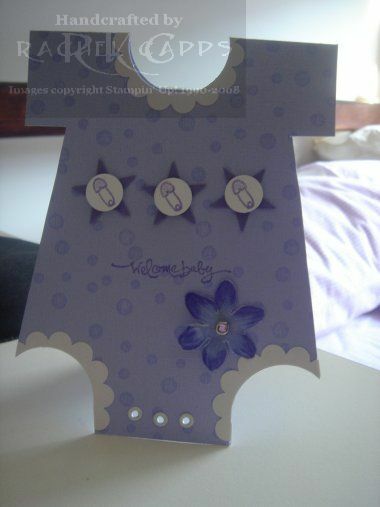 I’ve used the colours Almost Amethyst and Lovely Lilac for this card … even on the flower! Of course, although it is not so noticeable in the photo, I have also used Dazzling Diamonds on the nappy pins. I hope it is a nice keepsake for mum and dad to keep for their new baby girl. I finally found a teeny bit of time to play with my Sending Happy Thoughts Simply Sent Kit last night. 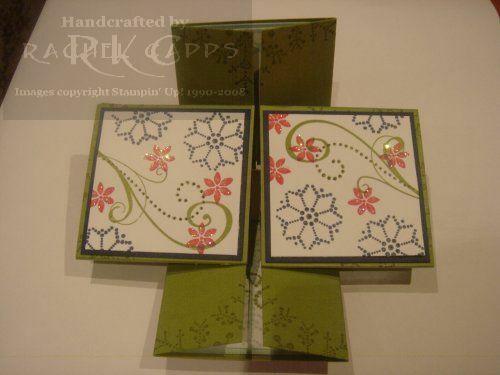 I must say, I’m really impressed with the stamp set … the flower stamps have a two-tone effect. They are gorgeous!! If you’re interested in adding a birthday promotion stamp set to your collection then make sure you email me before the end of the month! 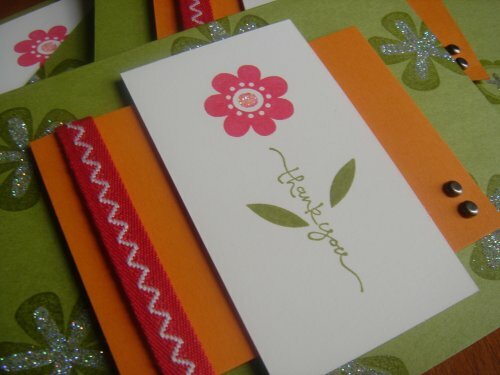 One of the reasons I joined Stampin’ Up! was to be a part of a team filled with great ideas. To me, this card is the epitome of sharing great ideas. Last week, one of my team leaders, Jayne Mercer, ran monthly training for her group. This was one of the cards she shared with everyone there. Unfortunately, I wasn’t able to make that training. 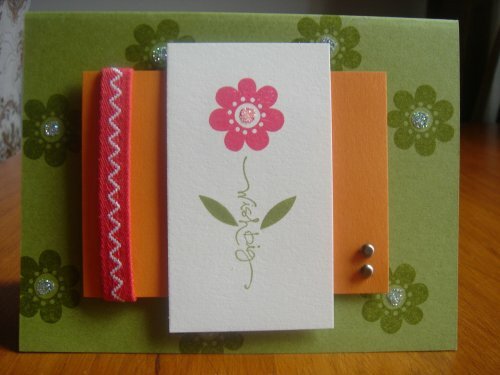 Yet, one of my team members, Michele, was able to go and she dropped by my house on the way home and showed me her card. Well, this card took me back to being a little girl! How cool it is to keep folding it over and over again! 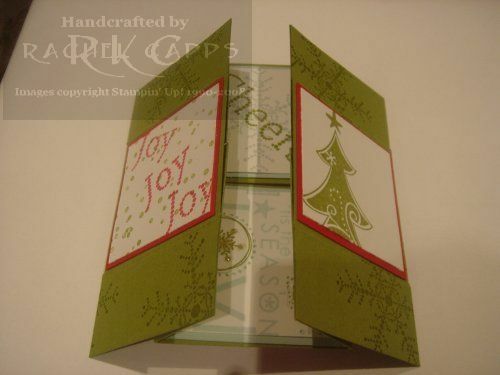 And so, again, the beauty of being in Jayne’s team was that I could log on to her special team Forum and within a day Jayne had shared a video tutorial with all her team members on how to make this card. I am one lucky person to be a member of such a team! Thank you, Jayne, for sharing your talent! You can see Jayne’s talent here. I must apologise for the poor photography … my camera is on it’s way out! 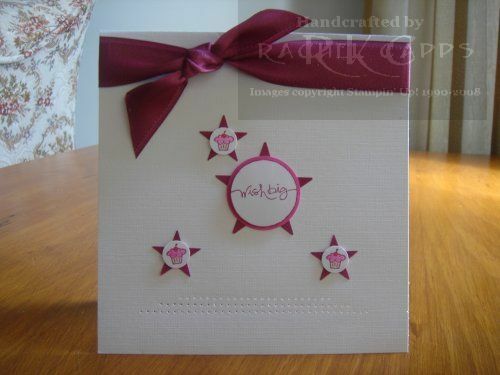 I’ve used my favourite Christmas stamp sets, Season of Joy and the Snowflake Spot to decorate the card. I’ve also used the definition “wish” from Life Definitions. It’s a great stamp, that one! The colours I’ve used are Old Olive, Real Read, Night of Navy, Purely Pomegranate and Soft Sky. The Dazzling Diamonds I’ve used and the paper piercing isn’t too obvious in the photographs. Sorry! It was also my brother’s birthday last month. 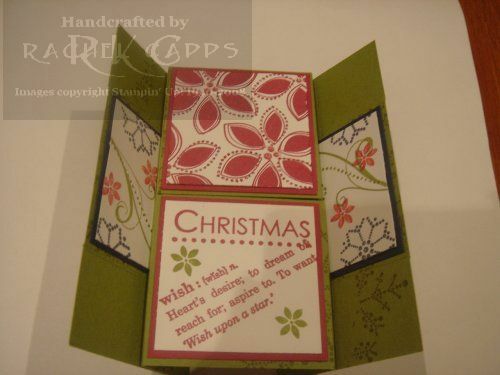 And this is another card I’ve made using the Outlaw Designer Series Paper. 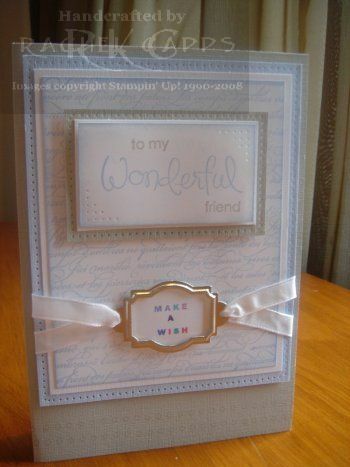 I managed to make this card without a Really Rust Ink pad … (on my wish list!) … I did use the Really Rust marker pen though, which helped out! 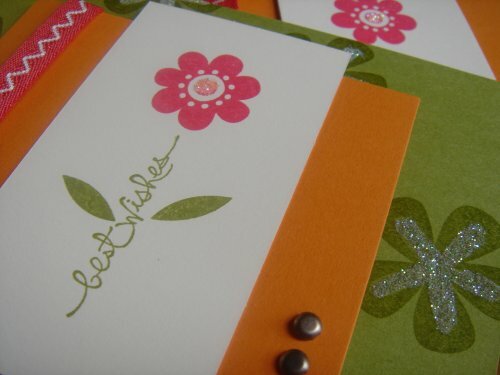 I like these colours for a masculine card … Chocolate Chip, Really Rust and Very Vanilla. 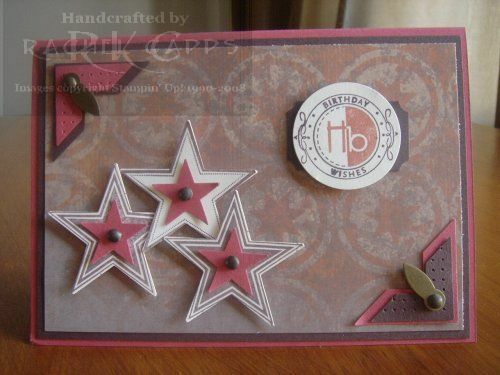 I must admit, I did go on “punch” overload with this card … I have used the Large Star, Star, Designer Label, 1 3/8″ circle and Photo Corners. It didn’t seem like so many when I was making the card! Yesterday it was one of my wonderful friend’s birthday – Michele. Michele has been a wonderful friend for so long now, including being one of my bridesmaids, but Michele is also a fellow stamper! A true kindred spirit!! You can see her gorgeous creations here. Michele and her husband put on a great family BBQ as always – it was a lovely way to spend the afternoon with them celebrating a special day. Thanks, Michele & Dave! And “Happy Birthday” again, Michele! I’ve used the stamps En Francais, Wonderful Favourites, So Many Sayings and not so noticeable on the bottom of the card One of a Kind. The colours are Sahara Sand and Bashful Blue (blue is a colour I always think suits Michele as she has lovely blue eyes!). I also used the gorgeous styled silver hodgepodge from this months’ Spring Mini with white taffeta ribbon. I coloured in each letter of the phrase “make a wish” with my marker pens … not sure I’m 100% happy with that, perhaps I should have stuck to neutral colours there. What do you think? My Uncle turned 60 years old last month! And he’s the best Uncle too. Although he doesn’t like the fuss of a birthday, this is the card I’ve made. Now I just have to get over to visit him! 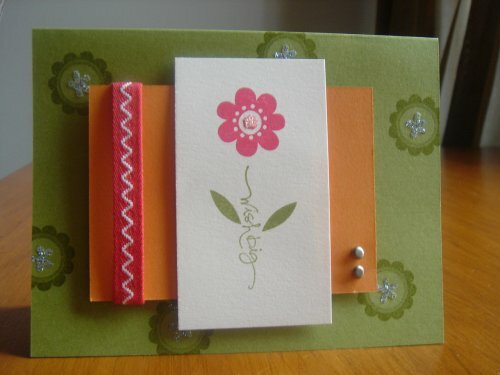 This is a really simple card to make, which I must say, for a masculine card, I’m amazed to say! I’ve used the Outlaw DSP, chocolate chip, sage shadow and very vanilla cardstock and the strip of chocolate chip wide grosgrain with my hodgepodge hardware. 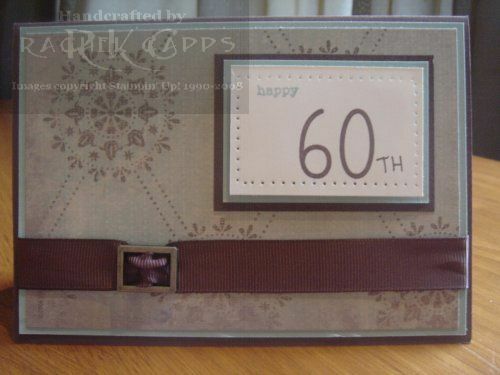 The only bit I’ve stamped has been the “Happy 60” which used Everyday Flexible Phrases and Best Friends Numbers. I couldn’t have placed the 60 so neatly without my stamp-a-ma-jig! I hand wrote the “th” with my chocolate chip marker. 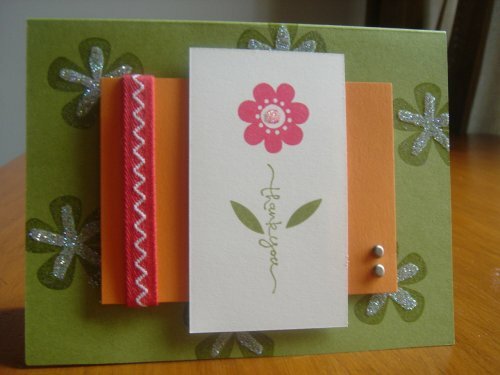 A little bit of paper piercing and the card was done! I’d like to thank Michelle LeBreton for making me realise that I had to have the Outlaw DSP to make a masculine card. 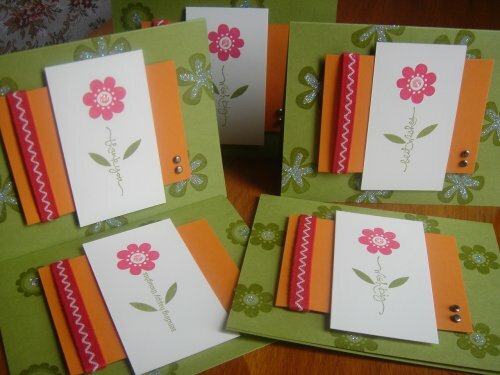 You can check out Michelle’s stunning cards here. 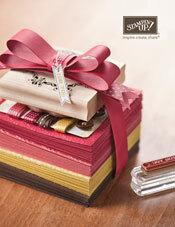 And thanks to Teneale Williams too for the inspiration here on the elegant simplicity of the ribbon and hodgepodge. 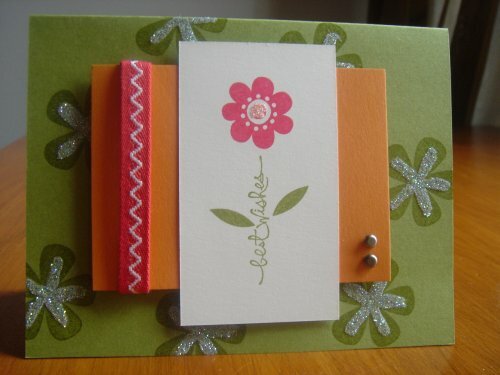 Sometimes it is a little part of someone else’s card that inspires me to create my own card … what inspires you?